Yesterday two phenomenal events occurred. 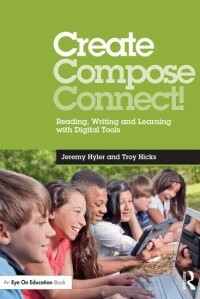 First, as many know, the book I co-authored with Troy Hicks with a foreword written by Liz Kolb was released yesterday. The out-pouring of support has been great. It feels awesome to finally have it out there where the world will be able to read our work. Just when I thought I couldn’t have a better day yesterday, I had the most amazing conversation with my 8th graders about formal -vs- informal writing and texting. Our conversation started with the grammar template that is mentioned in our book. Below is a screenshot of that template with a link. The students had a solid grasp on compound sentences as we reviewed them. When we talked about the texting portion of the template the conversation heated up! The class decided texting would be an informal space due to the simple fact that an abundance of their text messages are to their friends. As we broke down our mentor sentence from The Giver, students worked with partners to determine what the sentence would look like as a text message to a friend. That is when the nerdy teacher in me became fascinated. The students talked specifically about “Digital Talk” such as “Lol” -vs- “LeL” and “okay” -vs- “ok” or just “k”. I was super excited to hear them debate their language through texting. I learned that students actually feel they know the tone of a text message that is being sent to them. For example, if someone just sends the letter “k” for “okay”, students automatically assume the person who sent them the text is upset with them. Now, I have had several conversations with students, teachers, parents, and other adults about how tone is hard to determine through writing a text message unless an emoji is attached or there are certain colorful words that are added. However, my students wholeheartedly believe that by not making the effort to type even one more letter for “Ok”, the person on the other end of the message is not happy. 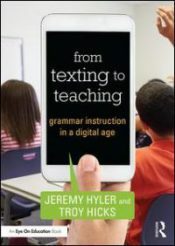 As my 8th graders continued to talk and discuss their language, my smile became bigger as one of my students raised their hand and stated, “There are rules for how we text message back and forth with each other. It’s like we have our own language.” At this point I wanted shout out and say YES! I contained my excitement and asked, “Does everyone know the rules?” It was agreed by most, if not all, that not everyone knows the rules that must be followed for texting. I found this rather interesting, so I probed deeper by asking, “Are all of the rules already established or are there more made up as time goes on?” I received many responses, but the ultimate conclusion I came to was there are new rules added as certain situations render new ones to be created. Students continued to express their thoughts and opinions as we plunged forward with creating an effective text message for our mentor sentence but the fact remains ladies and gentleman; students have their own language and we can not take this away from them. Instead, we need to dive deeper into their world and figure out how our students function in all of their writing spaces. It was a magical day to hear my 8th graders talk about the way they write with tone, audience, language, etc. I am still processing our conversation and I am positive there is more to learn. It is such an interesting topic to keep thinking about. More soon!